It is so easy for Golden Retrievers to warm into anyone’s heart. They are cute and fluffy, full of energy, and very, very clever! Golden Retrievers help assist the weak and are smart enough to be trained for daily tasks such as loading laundry, retrieving the remote control, and whatnot. All they want in return is your tender loving care! Of course, fur-parents are compelled to find the most comfortable sleeping setup. But how can you find the best dog beds for Golden Retrievers? Scroll down and learn what factors to consider! But if you are already well-versed with the dos and don’ts of dog bed shopping, go ahead and check our recommendations. 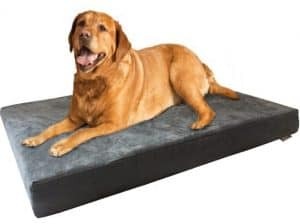 As far as comfort and reliability are concerned, the Headrest Edition orthopedic dog bed by Big Barker is second to none. This humongous dog bed won’t flatten out even if you have big fat Goldie who loves to nose-dive! This mattress is precisely structured to provide even weight distribution and exceptional strength. The company even offers a money-back guarantee if their product won’t retain its shape after 10 years of wear and tear. Additionally, this bed is 7 inches thick. It features a high-density memory foam construction with open cell insulation, keeping the bed comfortably cool during hot temperatures. Aesthetic-wise, you can tell that it is such a remarkable piece of furniture. It is also worth noting that this all-American product has met the strict standards of CertiPUR-US. fabric withstands chewing, scratching, etc. This orthopedic dog bed by the Go Pet Club is made of 100% memory foam, rather than layers of different foam types. This ensures your beloved pet gets the comfort he deserves, as well as the support he needs to stay in top shape. As an orthopedic bed, it molds to fit your dog’s silhouette to minimize pressure on joints. Moreover, this bed is enclosed with two types of protective covering that are easily removable for cleaning. The waterproof liner keeps drool and accidents from seeping into the foam, while the faux suede cover cradles your beloved pet to sleep. This bed is comprised of a 2-inch thick high-density support foam topped with a 2-inch thick memory foam. It is an excellent choice if you want a comfy orthopedic bed with a 100% waterproof cover. A fully waterproof cover ensures the memory foam mattress is well-protected against accidents, drool, moisture, and whatnot. It is one of the best choices you can make for an incontinent dog or a pup who is yet to be trained. Despite its name, the DogBed4Less Orthopedic Dog Bed is not a shabby dog bed that you can compare with discount dog beds. It is actually a wonderful dog bed priced reasonably - if not exactly cheap. It features many characteristics you want in a high-quality memory foam bed. First of all, this bed boasts is a solid piece! 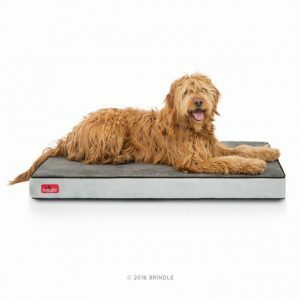 Unlike some other beds, the DogBed4Less is constructed around a 4-inch-thick memory foam that is five times more dense and heavier compared to regular memory foams. This bed also has equally impressive covers. This bed by Friends Forever was certainly designed for dogs who love to curl up! It features an ultra-soft bolster that is firm enough to hold the brunt of a Goldie’s big, sleepy head. This bed also uses the company’s very own patented memory foam that is enclosed with a 100% microfiber suede. Comfort is inarguably its main selling point! Additionally, this premium bed by Friends Forever is ideal for convalescing or aging pets. It has a low and wide access point to make it a lot easier for any arthritic dog to climb in and out of his bed. 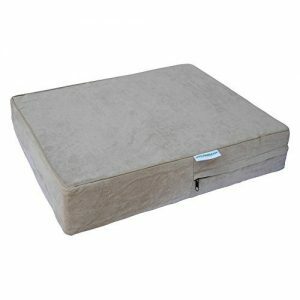 A dog who is either a young one or once young will surely love the velvety softness of the FurHaven Pet Orthopedic Mattress. This bed features a fleecy faux-fur sleeping surface, making your Goldie snug as a bug! Additionally, this bed highlights a grooved orthopedic foam construction. It provides proper weight support and keeps airflow at a maximum to keep your dog refreshingly cool during warm climates. This bed is approved by the CertiPUR-US. Goldies are full of energy, even when they sleep. They tend to move a lot during the night and throughout their afternoon siestas. In addition, Goldies love to perform a little yoga after a nice sleep. For these reasons, it is a great idea to get your canine buddy a bed that is reasonably bigger than he actually is. Having a few extra inches allows him to move around when he wants to. You should also take into account the space or location for his bed. For instance, if you want to place the dog bed in a corner to save more space, going for a circular bed wouldn’t be a wise thing. Of course, nobody wants a pancake bed. Thickness is another important factor to look for when choosing your Goldie’s bed. Generally, Golden Retrievers weigh 75 lbs. So, you need a thick foam mattress that can hold its weight and provide support. A thick foam also provides a nice level of warmth that can benefit any dog. Not all beds provide orthopedic support. 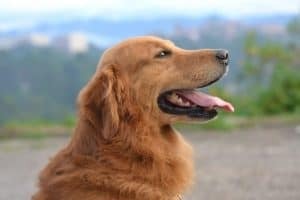 The best dog beds for Golden Retrievers are the orthopedic beds that use high-density memory foam are a little pricier compared to ordinary foam mattresses. However, such a bed provides immediate relief for dogs suffering degenerative joint diseases, such as arthritis and dysplasia. It molds to the contour of your dog in order to distribute even pressure, rather than concentrating on the joints. Additionally, it doubles as a preventative. Golden Retrievers are at a higher risk of developing arthritis. Thus, it is vital for your Goldie to use this type of bed in order to help prevent the occurrence of hereditary conditions in dogs. Choose a dog bed that is free of flame retardants, heavy metals, and other harsh chemicals. You don’t want your dog inhaling toxic fumes while he sleeps. Take note that some dogs are also allergic to certain fabrics, such as wool and polyester. So, select a dog bed that sports a hypoallergenic cover. If you want to be sure, look for a product that has met the CertiPUR-US standards. Knowing that your furry pal is safely snoozing also gives you peace of mind. Poor quality sleep can cause erratic behavior. It can also lead to insomnia, which can lead to depression and lead a further absence of sleep. Therefore, poor sleep quality is as detrimental as no sleep. So, how do you make sure your dog sleeps comfortably? Another benefit you get for choosing a high-density memory foam bed is the comfort it provides. Unlike cotton batting and other fillers, it won’t lose it shape even after several years. It shapes your dog’s natural alignment, putting the joint pain aside. For your benefit, select a dog bed that sports a machine washable cover. This facilitates the process of regular cleaning, so it won’t have to feel like a nasty chore. Dogs, despite how sociable they are, also need some time to unplug themselves from the hustle and bustle of daily life. Your Goldie will truly appreciate it if you provide him a comfy place to be away from the bossy cat, your noisy kids, or even from you. After his short retreat, your Goldie will bounce back glowing with joy! Just like us, a good quality sleep can positively impact a dog’s health and well-being. It reduces inflammation, stress, and puts your dog in a much better mood. If you don’t want your dog to leave his signature smell on your bed, provide him with his own. Make sure he will find it irresistible. Remember, your dog knows which room provides the best accommodation. 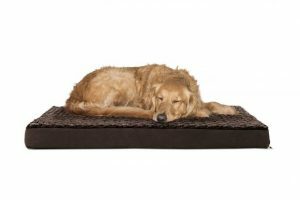 We highly recommend all six dog beds in terms of quality and comfort for your golden retriever. We are confident that our selections provide tangible benefits for you and your beloved pet. Obviously, the Big Barker Headrest Edition is our favorite out of all the best dog beds for Golden Retrievers. It is built with premium materials and highlights excellent craftsmanship. However, it is probably too expensive for budget-minded fur-parents. But if you are looking for the highest-quality dog bed possible, then you can never go wrong with it! Now, give your Goldie the bed he deserves! He needs to get a good night’s sleep and enjoy life even more. Being able to see more of his golden smiles is just one of the many reasons why you should never hesitate to provide him the best you can offer.